When will Britain ban Antifa? …in this photo, a clean middle-aged British man, outnumbered but courageously defending himself against masked scum. The mayhem in London this weekend was not inevitable. The police had laid down ground rules, and the patriot demonstrators were geographically separated from the rabid reds. So everybody had a place to say their piece. UNTIL the leftist vermin in the photo – a small sample of a similarly savage mob – came after the patriots, not to debate or peacefully heckle, but rather like salivating rabid beasts, dead set on suppressing free speech by vicious thuggery. 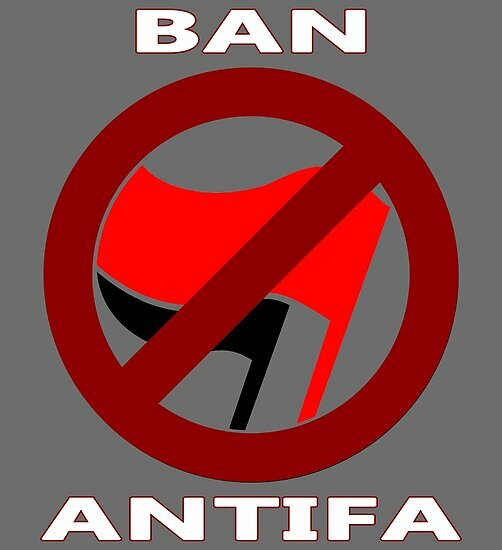 Banning Antifa is the only rational solution! A catch-law against covering one’s face in public, like the one the Dutch I think just introduced, would be a first step. The red nazis go by so many names that just banning ‘Antifa’ might not work. I was wondering if you know about a great bill just been introduced in the House of Representatives in the USA by a good conservative Congressman, Dan Donovan. He the same as you is sick and tired of these yellow red nazis who hide their faces, so his Antifa Bill would provide for up to 15 years imprisonment on any person who “injures, oppresses, threatens, or intimidates” anybody if the aggressor is masked or in disguise. The Democrats will oppose it because they like the red nazis but as usual the problem is RINOs in the Republican Party. Todd, I agree that is good as a measure but the government in England is as wet and weak as a landed squid. Banning face covers not a chance. May would never upset the sharia mob. She is all for sharia law, said so, out loud, on the record.